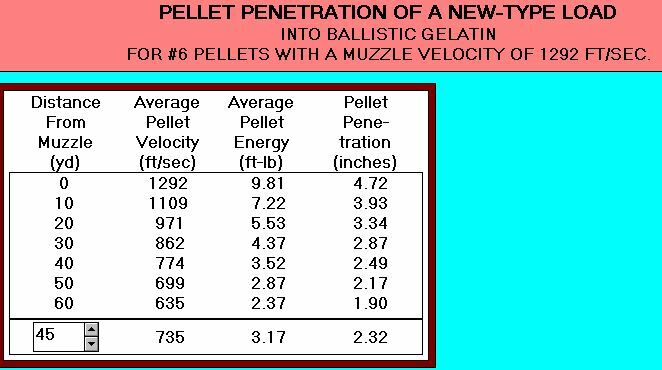 By far, the most important factor in pellet performance is penetration. It is true in self-defense situations, it is true in hunting with rifles, and it is true with shotguns. 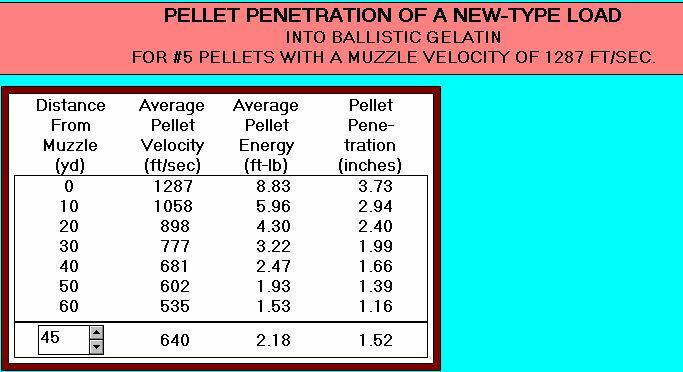 Dr. Martin Fackler has pioneering much of today's accurate, usable wound ballistics, including the use of calibrated ballistic gelatin as a comparative tool. With shotgun pellets, we don't have the additional considerations of yaw, induced spin, hollow points, or boat tails. Aside from pattern density at the ranges we shoot at, the primary consideration is penetration. There are problems with ballistic gelatin, as Dr. Fackler has pointed up. It isn't handy to mix up and to be good comparison tool it must be calibrated. That is a big issue with most of the ballistic gelatin block pictures you may have seen. They exist in the catalog literature primarily to be pretty pictures, not as calibrated comparison tools. Shotshell wounding ballistics have largely been kept in the dark ages, as the notion of "this shell killed a duck really good" has no basis, no merit, and is the type of anecdotal information that is beyond meaningless. Yet, it persists. Of course, whether waterfowl, upland game, or turkeys, the anatomy is as far from a cold block of ballistic gelatin as can be imagined. Ballistic gelatin has no vital organs, no circulation, no bone, and no feathers. It also has no health or will to live, and generates no adrenaline. It is consistent, though, if calibrated, and consistent testing parameters is paramount to yielding usable results. No precise control group, no results are formed that can be relied upon. We are here to talk turkey, though, so let's do it. 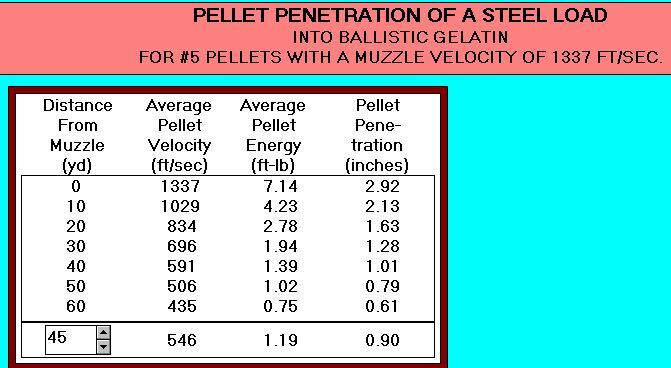 Using Ed Lowry data, we will compare penetration of various shot sizes and materials into ballistic gelatin at various ranges. All of the following charts assume the identical 3 foot velocities of 1200 fps, though as you will see the actual muzzle velocities are higher. To quickly take a turkey, I want a gel penetration of right at an inch and three quarters or so minimum. 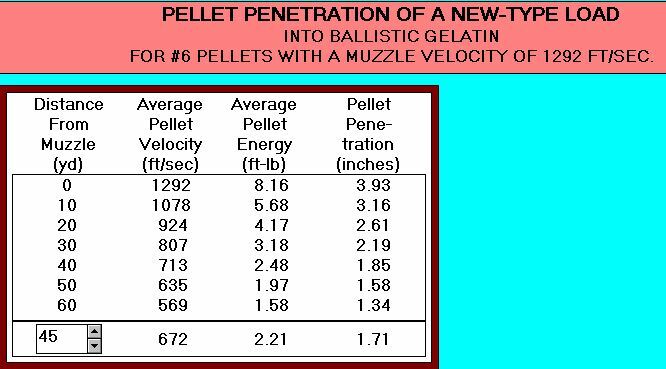 Some pellets will blow through, many won't, for a turkey's head and neck are a lot more variable than our ballistic gelatin can be. One and three quarters inches is adequate to do the job. One look at this should amaze you and show just how bad steel shot is compared to lead and other materials. It fails to give us 1-3/4 inches of penetration at even twenty yards. Now you know why using steel as a direct replacement for lead has been such a horrible crippler of game. No. 5 lead shot, fired at the same velocity, is dramatically better than steel, giving more penetration at 45 yards than the same size steel pellet can manage at 20 yards. 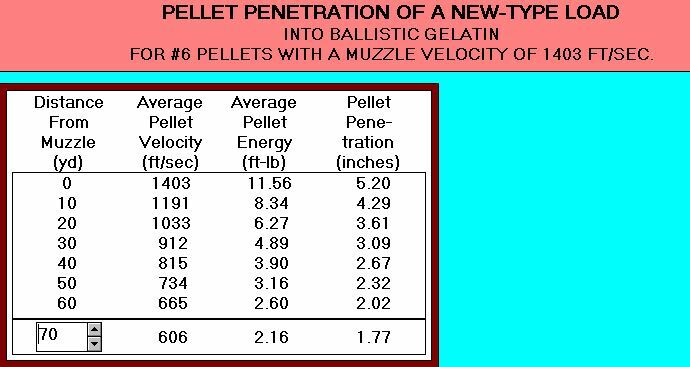 No wonder #5 lead has been a solid pheasant and duck pellet for so long. The issue with #5 lead is not penetration on turkeys, though. At extended ranges, lead patterns quickly become unacceptable thin as the pattern board shows. In the 35-40 yard arena, a heavy payload of #5 lead in a quality shell with a quality choke, fired at moderate or slightly lower than standard velocities can often pattern sufficiently well. For what it is worth, the NWTF has stated that 40 yards is the maximum ethical range at which to take a turkey. Kent Tungten-Matrix are loads that have given me excellent results, and are billed as the "one true alternative to lead." Are they? 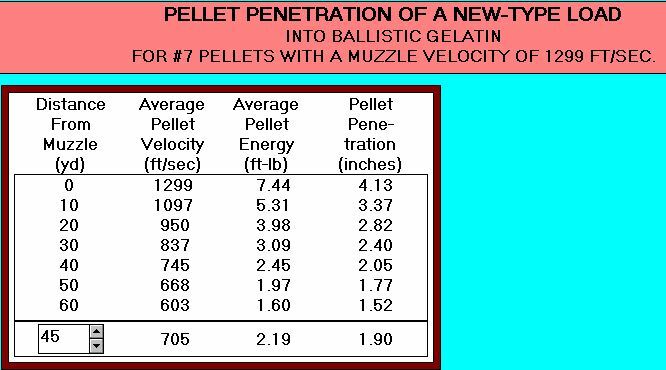 Though safe for older barrels (unlike steel, HD, and Heavyweight) the answer is yes, Kent TM is very close to the best lead loads in patterning performance and wounding ballistics. This should be an eye-opener. Federal Heavyweight offers more penetration in #6 shot at 50 yards than #5 steel has at just ten yards. 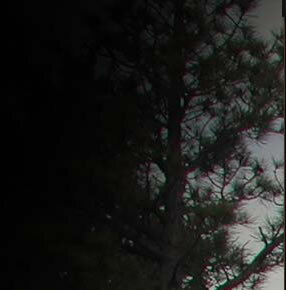 Federal Heavyweight has more penetration at 60 yards than the larger #5 lead shot has at 40 yards. This should also expose a couple of the prevalent myths out there that don't seem to go away. The first myth is "velocity kills." Certainly, you need some velocity to have a projectile. Muzzle velocities only mean something at the muzzle, though, not downrange. 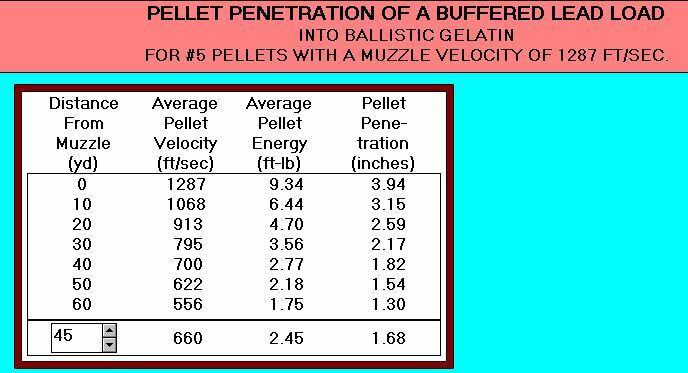 The highest muzzle velocity is the steel load, though all of these loads have the common 1200 fps "3 foot" velocity, the #5 steel load has the highest velocity at the muzzle. Yet, it ranks dead last in penetration at the muzzle. What about "energy kills"? Though energy numbers are easy to calculate, they do not directly calculate into penetration or lethality. 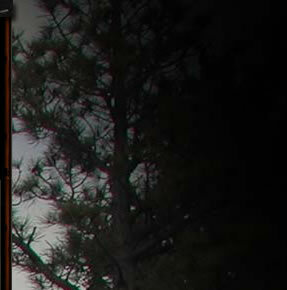 Our #5 lead pellets have more energy at 45 yards than either Winchester HD #6 or Federal Heavyweight #7 pellets. But, both the HD 6 shot and the Heavyweight 7 shot outpenetrate lead. If you consider the penetration of all of these loads, you might be believe that Federal Heavyweight #6 is far and away the best choice going. Well, it penetrates the best-- no doubt about it. But, we also have to consider pattern performance and pellet counts. Federal Heavyweight 12 gauge 3 inch turkey loads are 1-5/8 oz. They do, clearly and soundly outpattern and out penetrate much heavier, harder recoiling, 1-7/8 oz. and 2 oz. lead loads. But, you can't put more pellets in the pattern board (or in a turkey's neck) than you started with. The Federal Heavyweight 12 gauge 3 inch shell (PHT193F) has the following shotsizes and pellet counts available: #7 = 353 pellets, #6 = 270 pellets, and #5 = 206 pellets. As long as we are talking turkey, let's try to cover a few more bases. 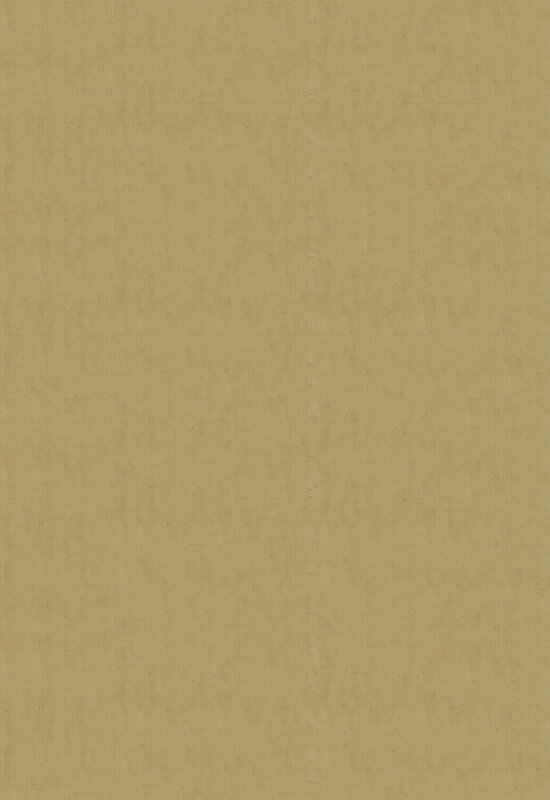 What about #3 steel? After all, for years the theory has been just increase your shot by two full sizes over lead when you are forced to use steel, and all is well. Is it, is it really? The answer is heaven's no. Steel #3 shot fails to produce our 1-3/4 inch penetration past 30 yards. It has a higher muzzle velocity and energy number than our #5 Tungsten Matrix, #5 lead, #6 Winchester HD, and #7 and #6 Federal Heavyweight loads. There goes the "energy and velocity" hyperbole once again, right down the drain. It is markedly, clearly inferior to every shot material and size combination discussed here except for smaller steel shot itself. No. 3 steel fails badly past 30 yards. 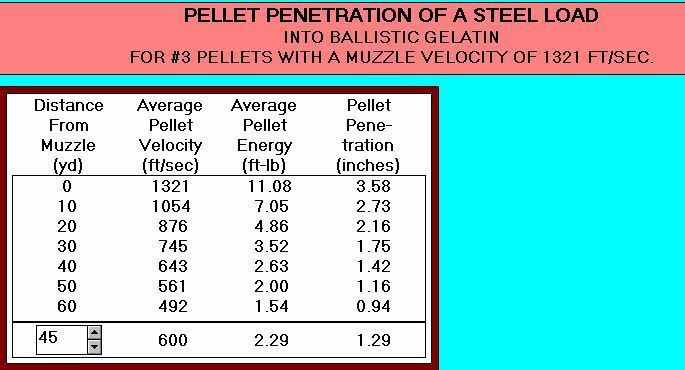 Worse yet, the pellet count of 1-3/8 oz of #3 steel (about as much as can be stuffed into a 3 inch 12 gauge shell) stinks on ice as well at about 220 pellets. Good old #5 lead has better penetration at 40 yards than the two sizes larger #3 steel has at just 30 yards. If you think steel is "terri-bad," you couldn't be more correct. It is one of the most remarkable game-cripplers ever devised when used beyond its diminutive range. How far can we shoot? It doesn't make sense to shoot at ranges we haven't patterned at, it doesn't make any sense to pull the trigger on a bird that we don't know the range of, nor does it make any sense to use a load that we don't know has adequate penetration to get the job done. But, that question invariably comes up even though at radically extended ranges we need to be more aware of windage, drop, and likely need a better sighting system then shooting with a bead. Federal makes a 10 gauge load that holds two full ounces of #6 Heavyweight shot with a 1300 fps muzzle velocity. Heavyweight #6 gives 1-3/4 inches of penetration at 70 yards. Surprisingly, Federal even makes a #5 Heavyweight turkey load in 12 gauge, but not in 10 gauge. Based on what their #6 is capable of, I have no idea what the #5 pellet is for. Here's a look at that Federal 10 gauge load PHT101F. There is a lot of advice out there, some good and some let's say "antiquated." The NWTF states that if you are using a 20 gauge, you need to be within 25 yards of your bird. That may not be "bad" advice, but it has no bearing if you are using 1-1/2 oz. Federal Heavyweight loads in your twenty gauge. These shells (with the appropriate choke and verification of your pattern) put you in a better position to take a turkey at 45 - 50 yards than any 12 gauge conventional lead loads I've seen. The 1-5/8 oz. #7 Federal loads are even a bit better. At the same time, though, as ranges increase time of flight, windage, and even trajectory may become an issue. The pattern that has the largest effective spread at fifty yards and the one with the largest effective spread at 20 yards are not at all the same. So, as in most things, it is up to the individual to determine what suits his needs the best. Most experienced hunters understand that even though something is technically possible or even probable does not mean that it is preferable or well-advised. All that is left in the hands of the individual, as always. I'm glad we have increasingly wider options and choices, though. For a lot of hunters, a more pleasant to carry, faster handling, more maneuverable in the blind 20 gauge is just what the turkey doctor ordered.